It’s a fascinating insight as to why teams choose the designs and colours they do, and the problems surrounding the trend for darkness. Having followed the recent Challenge Mallorca series of races, I agree with Ralph Denk, the general manager of Bora-Argon 18. We are very concerned about the confusion in the race. We just got the proof at the Mallorca Challenge, where we barely recognized our riders and not even all black-wearing teams were at the start. He has a valid point. Even with a close-up image you have to check carefully. All those subtle differences in design detailing really don’t help a directeur-sportif struggling with a live feed at the back of the peloton. 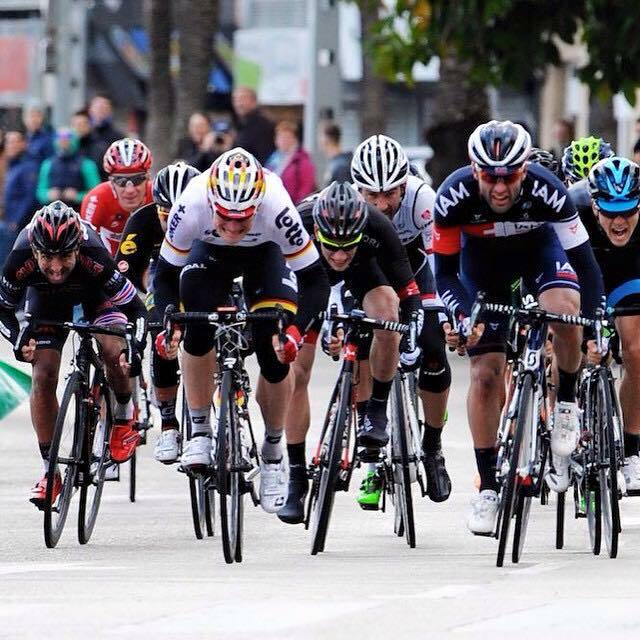 How many dark kits in this sprint finish at Challenge Mallorca Day 4? There can still be confusion even amongst the brightly coloured kits, I found it hard to distinguish between LottoNL-Jumbo and Tinkoff-Saxo when the action got fast at the Tour Down Under. Perhaps the last word should go to Eurosport commentator Declan Quigley. Fundamentally, cycling needs to make it easier to be a fan without destroying the heritage of the sport. I’m not suggesting shortening Paris Roubaix to 100km, merely making it easier to pick out your favourite bike rider in the bunch. 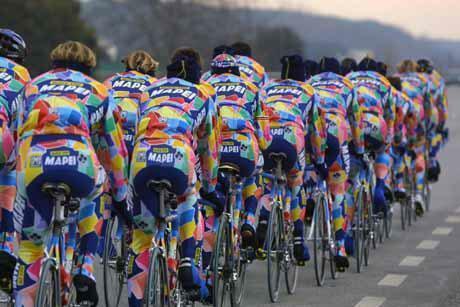 And for those in need of some colour to brighten the day, I bring you Mapei – my eyes!! I’ve said it elsewhere, including contacting Velon, but why don’t all riders in each team designated no:1 wear a red helmet, no:2 a blue one, 3 a green etc. at least then the riders would be recognisable and make it easier for spectators, commentators, riders and DS’s know who is who!